King Arthur presides at the Round Table. 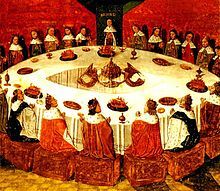 The Round Table was a table used by King Arthur and his knights, in the legends about him. The Round Table was in Camelot, the castle where King Arthur and his knights lived. In the legends, they met at the table to talk about the safety of Camelot and the kingdom, and about what adventures and quests they could go on. This got them the name 'The Knights of the Round Table'. The shape of the table was very important. Most tables are rectangular, and have a place called the "head of the table". This is the narrow part at the top, where the leader usually sits. Because the table was round, it meant that the people who sat around it were all seen as equal. The table is used by King Arthur and his knights. King Arthur's wife, Guinevere, did not have a seat at the table, but King Arthur did take her advice on occasion. In some versions of the legend, the wizard who lived in Camelot, called Merlin, also had a seat at the table. He was seen by King Arthur as a good friend and adviser. Some legends also note a special chair at the Round Table, called the Siege Perilous, or 'Dangerous Chair'. Legend says that the seat could only be used by a knight who had a pure heart. A person with a pure heart was seen as someone who had committed no crimes or done any wrong. In the tale, anyone who sat in the chair but did not have a pure heart would die instantly. It was kept free by Merlin for the person who would one day find an object called the Holy Grail. This was a magical cup that was supposed to have been the one that Jesus drank out of during the Last Supper. In the story, this person was either Sir Galahad or Sir Percival, depending on what version of the story is told. This page was last changed on 22 January 2018, at 03:45.